Here is a selection of collectible Macallan whiskies from our past and present auctions - to bid on a whisky please go to the auction. If you would like to sell whisky in an auction then please contact us. First Edition of 25th Anniversary bottling, excellent condition. Record online auction price set in July 2017. 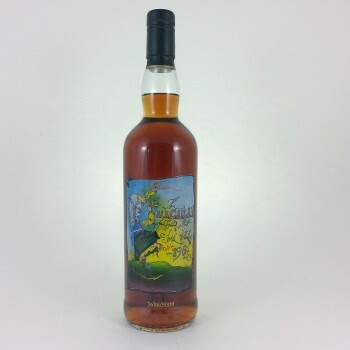 25th Anniversary bottling, Distilled 1968 bottled 1994, good fill level, excellent condition. 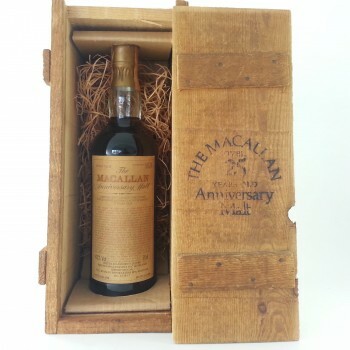 This Macallan 18 Year Old Anniversary Malt was distilled in 1978 and bottled 1996. It is in excellent condition. 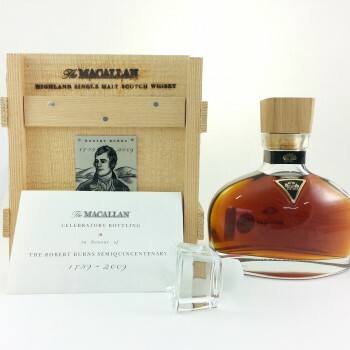 This Macallan 18 Year Old Anniversary Malt was distilled in 1980 and bottled 1998. It is in excellent condition. 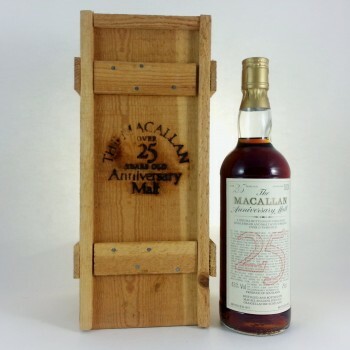 This Macallan Over 25 Year Old Anniversary Malt was distilled in 1957 and bottled 1983. It is in excellent condition. 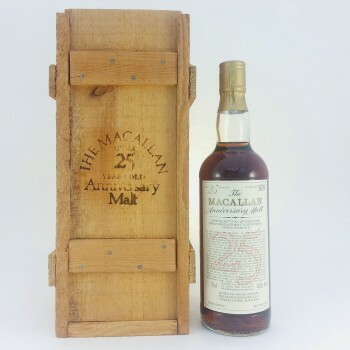 This Macallan 25 Year Old whisky was distilled in 1962 and bottled 1988. It is in excellent condition in a wooden box. This Macallan 18 Year Old whisky was distilled in 1971 and bottled 1989. The bottle is in very good condition and the box has slight wear and foxing. This is an Italian release of a very special malt - a selection of the very best in the Macallan warehouse distilled in the 1950s. Issued to celebrate Private Eye’s 35th anniversary in 1996 and limited to 5000 bottles. The stencilled label is by the famous cartoonist Ralph Steadman. 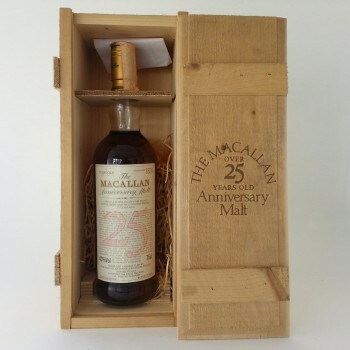 This Macallan 25 Year Old whisky was distilled in 1958 and bottled 1994. The bottle and box are in excellent condition - the best condition we have seen. This Macallan Aniversary Malt is an Italian release, distilled in 1964. It is in excellent condition. 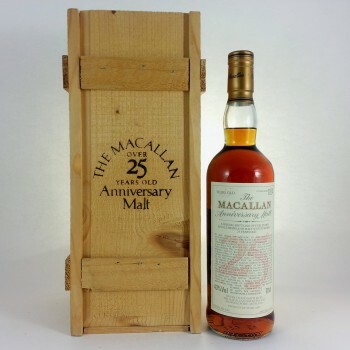 This Macallan Over 25 Year Old Anniversary Malt is in excellent condition. 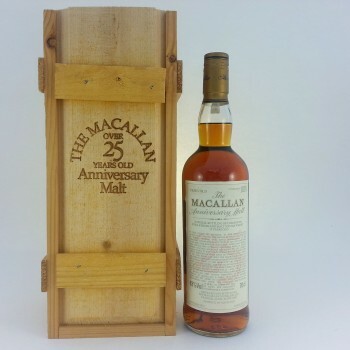 This Macallan Over 25 Year Old Anniversary Malt was distilled in 1974 and bottled 1999. It is in excellent condition. 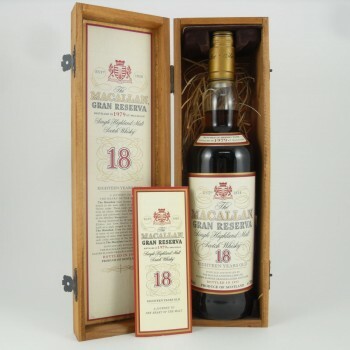 This Macallan Gran Reserva 18 Year Old whisky was distilled in 1979 and bottled 1997. The bottle and box are both in excellent condition. 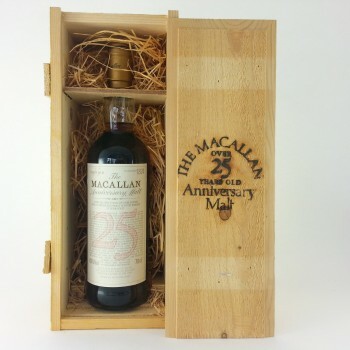 This limited edition Macallan Over 25 Year Anniversary Malt was distilled in 1964 and bottled 1989. It is in excellent condition.